Journey into Ancient Egypt, the most mysterious place in History, during a crucial period that will shape the world. In Assassin's Creed Origins Discover the secrets behind the Great Pyramids, forgotten myths, the last pharaohs, and - engraved in long-lost hieroglyphics - the origin story of the Assassin’s Brotherhood. AN ORIGIN STORY - Start here, at the very beginning, with the never-before-told origin story of Assassin’s Creed. 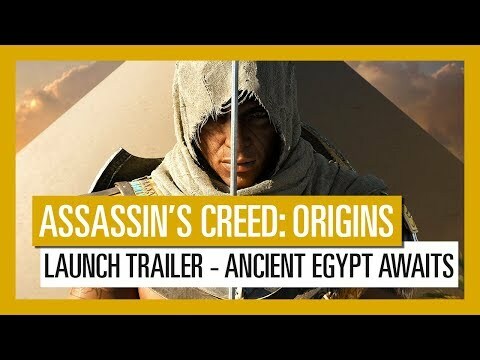 You are Bayek, a protector of Egypt whose personal story will lead to the creation of the Assassin’s Brotherhood. EACH QUEST IS A MEMORABLE ADVENTURE - Pick and tackle quests at your own will and pace- each of them tells an intense and emotional story full of colorful characters and meaningful objectives.